The phrase "I'm spiritual but not religious" has become a cliché. It's easy to find God amid the convenience of self-styled spirituality--but is it possible (and more worthwhile) to search for God through religion? 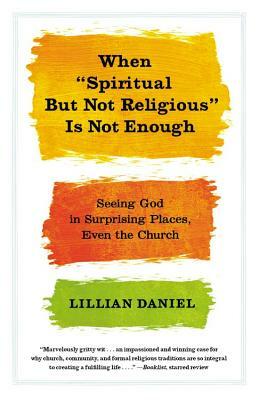 Minister and celebrated author Lillian Daniel gives a new spin on church with stories of what a life of faith can really be: weird, wondrous, and well worth trying. From a rock-and-roller sexton to a BB gun-toting grandma, a church service attended by animals to a group of unlikely theologians at Sing Sing, Daniel shows us a portrait of church that is flawed, fallible--and deeply faithful. With poignant reflections and sly wit, Daniel invites all of us to step out of ourselves, dare to become a community, and encounter a God greater than we could ever invent. Humorous and sincere, this is a book about people finding God in the most unexpected of places: prisons, airports, yoga classes, committee meetings, and, strangest of all, right there in church. Lillian Daniel has served as the Senior Minister of the First Congregational Church of Glen Ellyn, United Church of Christ, in the Chicago area since 2004. An editor at large for Christian Century Magazine, and a contributing editor at Leadership Journal, her work has also appeared in The Huffington Post, Christianity Today, Leadership Journal, Books and Culture, and in The Journal for Preachers. She has also hosted the Chicago-based television show 30 Good Minutes. Her Huffington Post article "Spiritual but Not Religious? Please Stop Boring Me" gained widespread interfaith attention after going viral on the Web. Daniel has taught preaching at Yale Divinity School, Chicago Theological Seminary and the University of Chicago Divinity School. In October 2010 she received the distinguished alumni award from Yale Divinity School for "Distinction in Congregational Ministry." She is the author of two previous books: Tell It Like It Is: Reclaiming the Practice of Testimony, and This Odd and Wondrous Calling: The Public and Private Lives of Two Ministers, and she contributed to Gifts My Mother Gave Me: Thirty-One Women on the Gifts that Mattered Most.